Rohatsu is the most intense Zen training week of the year. From December 1st to 8th, zen monks ‘celebrate’ the awakening of the Buddha by doing exactly what the Buddha did 2.500 years ago: sitting in concentrated meditation almost uniterruptedly for a week. It may sound crazy, but it is a very effective way to break through the false notion of ego, which is what Zen training is about. Many great Zen masters had a breakthrough during Rohatsu, and were able to realize their ‘true self’ like the Buddha did. In the middle of Rohatsu 2005, all of a sudden zenmaster Fukushima Roshi invites the westerners for lunch on December 8th, the final day of Rohatsu and the day of the Buddha’s enlightenment. I never had lunch with the Roshi apart from the time my wife Monique and I were married in Tofukuji. Mostly, it was just a short goodbye, sometimes in his undergarment at the door of his quarters, at best with tea in the Westerners’ Room. Thirteen years ago I was in Tofukuji for the first time. Back then, we – that is Chris, a Canadian, and me - had no one-on-one exchange (dokusan) to alleviate the intensity of sitting somewhat. Every single period of zazen lasted for 50 long minutes. As time went by, pain got worse. Minutes lasted hours, days seemed to turn into weeks. The whole week, we didn’t lie down. We spent the ‘night’, that is, ninety minutes between 1.30 and 3.00 am, in the training hall (zendo) with the monks. Sitting up covered with a blanket, leaning our backs against the little cupboards at the rear end of the tatami. Jeff Shore, at that time already a long-time practitioner at the monastery, was the whip to drive us through the Zen barrier: ‘This is what you came for!’ ‘You are not supposed to sit anything less than half lotus.’ He was there every day. Without his silent presence in the zendo and the comfort a few words in the laymen’s room (‘The skies are like Holland today, aren’t they?’), it would have been impossible to bear the intensity of that week. This time there is dokusan for us westerners, but only once a day instead of the usual six. The Roshi is ill, the monks are already training with his successor. This time, we do lie down and have naps during short breaks, which makes a huge difference. But nevertheless, all zazen periods last 50 minute again. It isn’t easy and that’s good. This may be the last time. It is clear that the Roshi is getting older. In dokusan, usually he is like a huge mountain, a fathomless ocean. No way you could reach him, not a hair’s breadth of leeway given. This time it is almost like coming to tea. He gives what he can on the eve of his life. Sweet and gentle, enjoying every moment of it. On the late morning of December 8th, Jeff, Alex, Hap and me report at the gate of the monastery for lunch. We are allowed to take seats. 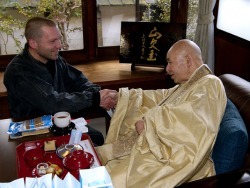 Alex Vesey has spent five years of his life as a monk in Tofukuji. Hap Tivey is the first ever student of the Roshi. He already worked with him when the Roshi was still a monk, 31 years ago. Jeff Shore lives in Kyoto and has trained under Fukushima Roshi for the past 24 years. A little later, the Roshi enters the room. He shows his age, but he is in fine spirits. He sits down and we have the great little bites that Yaoji-san, the home-caterer of the monastery, prepared. After Rohatsu, everything tastes good. This tastes exquisite. We talk. The Roshi smiles and makes jokes. He enjoys the occasion. I am happy to hear the Roshi state this so clearly. Jeff would never say much about this kind of thing. I mention that, but probably even that is already too much said. The Roshi just responds that that’s the way it should be. Then we have our rice and soup, and talk about all kinds of things. Later on we say our goodbyes to the Roshi. We kneel down at his side and hold his hand. It is strong. Dokusan: private interview with the Zen Master in which an exchange takes place about the koan (zen problem-question) that the practitioner is working on. 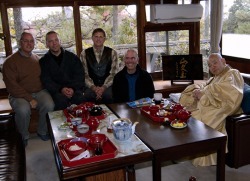 Fukushima: Zen Master of Tofukuji and Head Abbott of the Tofukuji branch of Rinzai Zen. Rinzai Zen is one of the two main streams of Zen in Japan, the other being Soto. Jakugo: capping phrases, poems to show one’s insight into the koan. Rohatsu: literally the eighth day of the twelfth month. Day on which the Buddha attained awakening. This is ‘celebrated’ in Japanese zen monasteries by a week of intense zazen practice from December 1st until the early morning of December 8th, during which the monks do not lie down to sleep at all. Roshi: honorific title for a Zen Master. Tatami: mat of about 3 by 6 feet. Living space of a Zen monk. Tofukuji: one of five main Rinzai Zen monasteries in Kyoto.